Lots of my friends know that I'm in training to become an official Therapy Cat. Glogirly says she noticed something special about me when I was just a kitten. I know what you're thinking... ALL cats are special and that's true. But Glogirly said there was something more, something bigger. Maybe it's because I love to play, or maybe it's because I love to cuddle. Maybe it's because I'm not scared of vets and vacuums. Or maybe it's because I just like people. Even the ones that say they aren't cat-people. Being a Therapy Cat definitely has its perks. Check out my sweet ride! 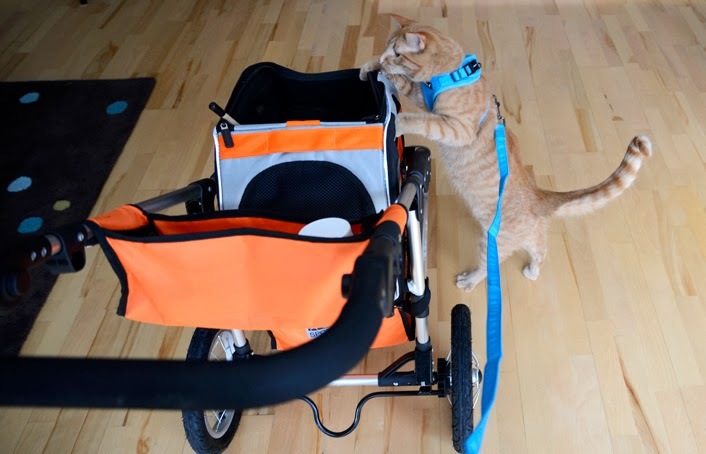 Some kitties might call it a stroller. But I say strollers are for babies. Ladies and Gentlemen, let me introduce you to my Waffle Wagon. I ride in my Waffle Wagon whenever I go on a therapy visit. 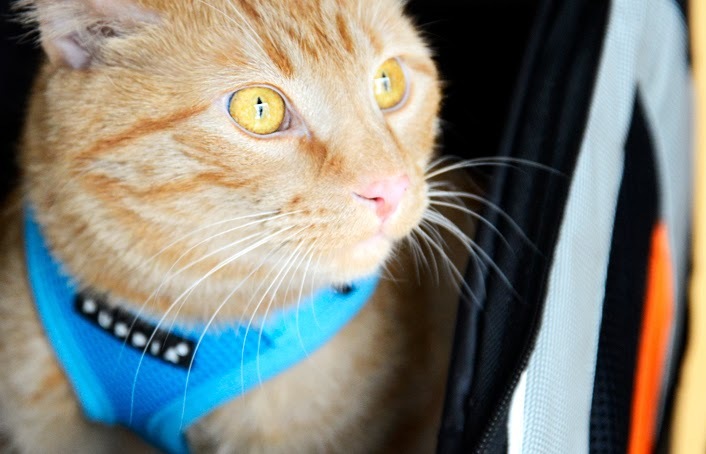 It's a purr-fect way to see the world and visit my friends. And it's a real chick magnet. But being a Therapy Cat is about much more than cool rides and fancy harnesses. 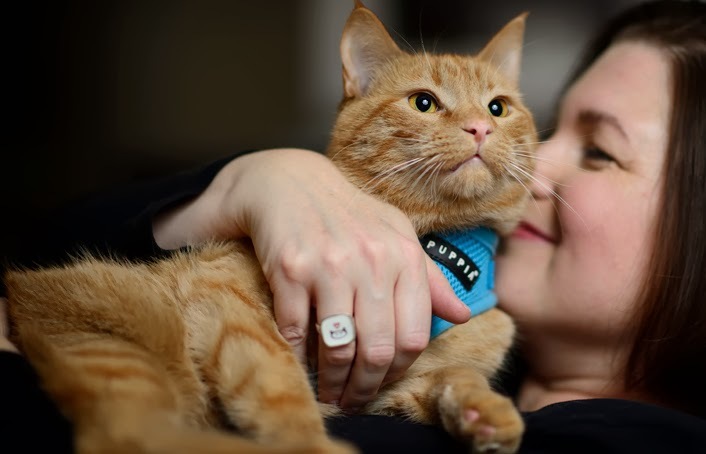 One of the most important things about becoming a Therapy Cat is understanding what it means to be a Therapy TEAM. That's exactly what me and Glogirly are. We're a team. Whenever we visit the ladies at the nursing home, I always know that Glogirly is right there by my side. It's kind of scary at first, going outside, riding in cars, and visiting strange places. So many new smells and sounds. But that's why we're a team. Glogirly pays attention to how I'm doing. I give her cues when I'm tired and need a rest, or when I'm curious and ready for more. I'm her A #1 priority. She's my protector and she always keeps me safe. Glogirly says my therapy work has created a very special bond between us. I think that means we're like Elmer's Glue...but without the sticky mess. But do you know what the BEST part of being a Therapy Cat is? Ok, you might THINK it's the treats. But that's really more of a fringy benefit. The best part is making people happy. Everyone at the nursing home is always SO excited to see me. They smile really big, they pet me, they laugh and giggle. And lots of them tell me about a kitty they once had. One nice lady had an orange cat, just like me, named Butterball. I think it makes her heart happy to remember her cat and share his stories. There was another lady who'd lost her ability to see or speak. But the staff knew she LOVED cats. Glogirly wheeled me over to her and she was able to touch my fur. She knew I was a cat right away. And even though her eyes couldn't see anymore, they lit up like stars in the sky. Glogirly said that it must be really hard for some of the residents to leave their homes and their families. Some of them probably had to leave their cat too. That's why it's so important I visit them. All this gushy love talk might make you think that Glogirly plays favorites. But that's not true at all. My sister Katie, the one I call the Boss, may not be cut out for therapy work, but she and Glogirly share a bond like no other. They talk about love, life and catnip. And I swear Katie has her own secret stash of treats. Must be a girl-thing. This post is sponsored by Nature’s Recipe on behalf of the BlogPaws Blogger Network. We are being compensated for helping spread the word about Nature’s Recipe For Moments on behalf of Nature’s Recipe, but we only share information we feel is relevant (and FUN) to our readers. Nature’s Recipe is not responsible for the content of this article. Do you have a special moment to share about you and your cat? Nature's Recipe is looking for stories through the eyes of your pets. It's a chance to celebrate the special bond that connects our hearts and brings us so much joy. Wait! I hadn't brought mommy her kleenex box yet! *wrings out tail* She's leaking all OVER me! Maxwell: Waffles, dood, I have to say, I'm proud of the work you do. I can just see their eyes light up when they feel your fur under their hands. And that is worth all the scary rides it takes to get there. My biggest fear is of getting sick and having to leave my cats for too long! I am glad to know if that ever happens there may be a Waffles to visit me and make my eyes light up too. Dang it, I should've gotten the tissues BEFORE I read this! Waffles I am so proud of you. My heart gets so big when I hear about your adventures in making people smile and leaving a happy thought in their minds when you are done with your day. You are right about teamwork. When a therapy or service animal works with a handler , they work as a team. There is never a I but always a Us. I know that the "Boss" and Glogirly have a special bond but honestly , I think Katie is truly a daddy's girl. Keep up the great work! Go #TeamWaffles. Waffles, you are truly an angel here on earth and we are all so lucky to know you. Glogirly is an extra special Mommy to share you with the world! The work you are doing together is just inspiring. Awww, Waffles, you made me cry! IN a good way. Bless you and Glogirly for realizing your special talent, hanging out with people, who need it very much. Fur therapy is wonderful! Waffles we think it's great that you are a therapy cat! And the Woman says it is so very cool that you are so outgoing! The Waffles Wagon - we love it! I don't know why everybuddy is crying. I found it very uplifting that a cat could bring smiles and hope to people who may not have anything to smile over. 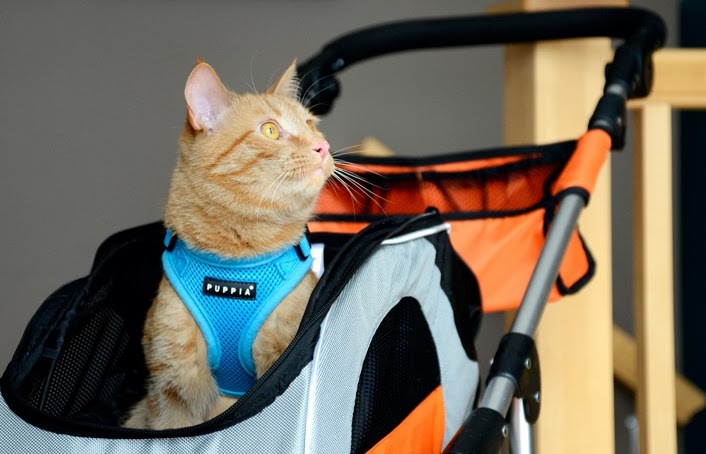 The only thing better would be to see this through Waffle's eyes when he gets that camera on his harness. Is it blurry screen night? I didn't get the memo *honks nose elegantly* or I'd have had a hanky handy! You are doing pawsome work being a therapy kitty! If people has any idea how important therapy work is - they would be hammering on your door for the gorgeous Waffles. What a communicator he is. 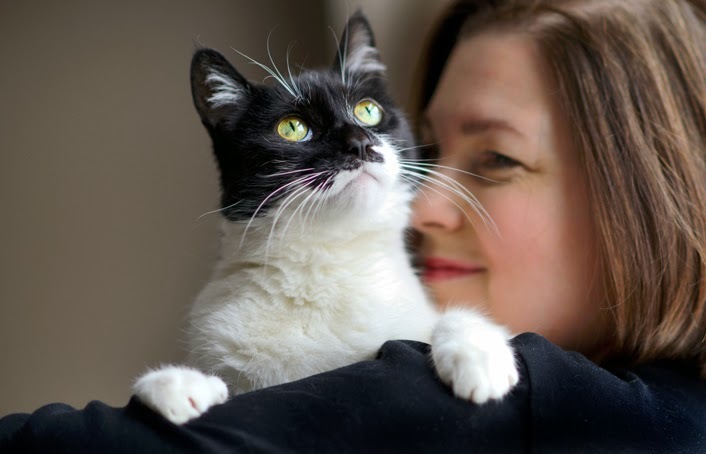 Waffles, I love that you're a therapy cat - my human says there need to be more kitties like you out there, and there are a lot of cat people in hospitals and nursing homes who are VERY lonely for feline energy. This is a wonderful thing you are doing for those people. If I had to live without my cats I really wouldn't enjoy anything. Nothing makes me feel better when I am down than a soft paw reaching up to my face and nose rubs and the most important thing of all the rumbling purr in that oh so soft little body. Waffles, you are special, being such a wonderful therapy kittie. It's special and wonderful what you and your girl do as a team! Wonderful outfit as well, you make quite the presentation! It makes me so happy to know how much you help make people happy. It's such a vital service you provide. Wish more could do it. I know therapy dogs and there good works here and it makes me so proud to know a Therapy Cat Team like both of you! Nice ring too. Look what you've done, Waffles and Katie! You've made The Staff slobber all over me! She's a wreck! Ewwwwwww! Put me down, Woman! Waffles, you're do GREAT work brightening up the nursing home!!! Normally, I rely on my morning dose of Glogirly, Waffles, and Katie for a laugh or at least smiles to start the day. This might be my favorite ever post, written from your heart with beautiful photographs. Warm heart and wet eyes here. Magic and Red used to live with two mummy's. Now one lives in a care home and adores when the staff bring in their own fabulous pets and she's always first in the queue for a fluffy cuddle. What a great story, Waffles, and such a wonderful thing that you and Glogirly do to help people. I'm not sure I even realized there were therapy cats, but I'm sure glad there are. Waffles, buddy, we're proud of you. You're doing some good work there being a therapy cat. Keep it up! Mr. Waffles, that was SUCH a lovely post. You and Glogirly are making so many peoples happy...good job! And that Waffle Wagon? SWEET! I was happy to hear about your therapy visits, Waffles. We had a visit with Nancy the Pet Psychic, and she thought Russell would be a great therapy cat as well. We haven't started anything just yet but you certainly give us inspiration. Soon, Russell...soon. This is so touching. You know, Waffles, when our grandpeep was going through chemotherapy, the visits from the therapy animals were her favorite thing. It really does mean the world to them. 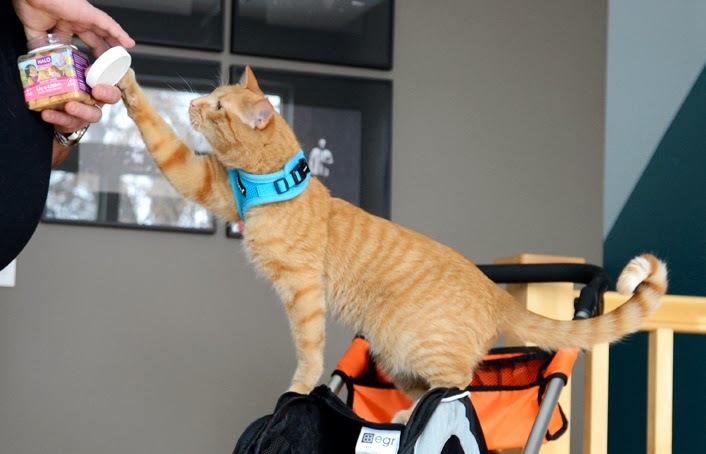 Thank you for being one of the brave kitties and teaming up with Glogirly to give the gift of visiting them. I absolutely loved this post!!! Waffles, I love you wheels! Its no strollers! Its then waffle wagon and its cooooooooool! You are going to make the bestest therapy cat there ever was! Waffles, keep up the good work. Purrs, cuddles and love spreading out to the world from one orinch cat! We love this post! It's wonderful you are able to make so many people happy Waffles and we love seeing you both with Glogirly too! Made me leaky eyed to but; in a good way. When I worked with elderly many didn't even have families so they were all alone. I always loved how their eyes lit when an animal or someone came to visit them. And they do give up many things to live there. Waffles are wonderful. Love the Waffles wagon too. Waffles, you make us smile. You have the most impawtant job in the whole world! Waffles, you and Glogirly as wonderful! Our mom bean's dad was in a nursing home and he loved it when the woofie came to visit We know he would have loved to see a kitty too...'specially a special boy like you. That is a very special story Waffles. You know how much you make me smile and I haven't even met you. Sherpa is my special boy 'cause the male person gave him to me as a very special gift. Katie, Waffles, GloGirly, you made my complete week to come. I loved this more than I can say. Both of you darling kitties and your mom light up the blogasphere. I love the Waffle Wagon, Waffles! And I so wish you lived nearby so you could be my therapy cat. I completely understand how even people who aren't cat people find you adorable. Hmmm.... I think that talkin' about the nip is important for both boys AND girls, Waffles. In fact, it's one of my FAVOURITE topics of conversation. That and snacks, of course. Always willin' to talk about snacks. We were all verlempfed when we read this post. Waffles you are such a special boy and we know you bring happiness back into the lives of those who truly need it the most. Katie just looking at the photo of you and Glogirl we all know just how extraordinary you are too. We love you both equally and differently. What a lovely post - you three make a great team!! What a great mission! It's awesome that you like people. Not a lot of cats like new people. Rascal seems to like anyone, but Rocco doesn't go near anyone, but his fam, even then, it has to be on his terms. Great post Waffles! That is very good and important work you are doing Waffles. You are making a lot of people happy.You and Glogirly make a great team. Wow I had no idea there were therapy cats! That makes total sense, I love it! You are perfect for the job Waffles, keep it up. Catzowey Waffles! Welcome to Animal Assisted Therapy! I been on the job for 7 years & I'ma only almost 8 so been working all my life. Itza great to be paid with abundacat purrs. You rock Waffles! 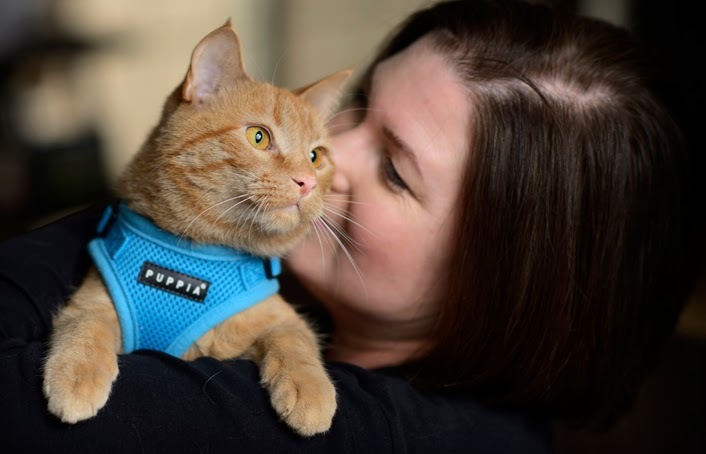 Waffles, I'm so proud of you working as a therapy cat, helping people connect to your soft fur and your purrs. The description of your bond with Glogirly is super-special because it does take a team to bring that love to others. There is NO doubt that Glogirly and Katie also have their own unique and lasting bond--we at Squeedunk completely understand what you mean--no favorites! 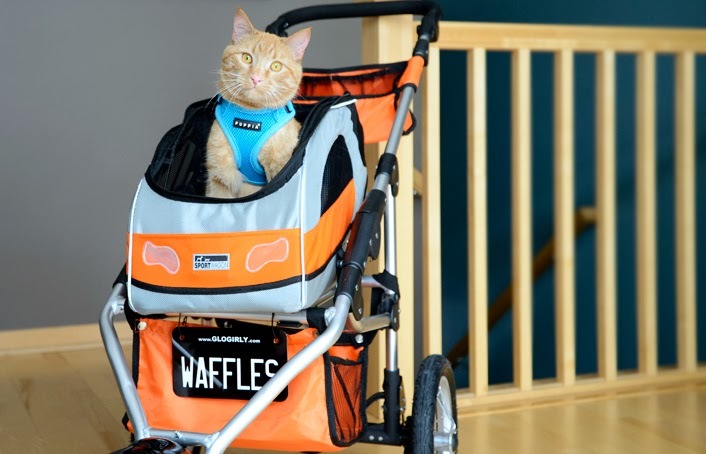 Love the Waffles Wagon, it's just purr-fect! Keep us informed of your visits, Waff. We heart you! Reading this post warmed my heart. You are amazing, Waffles. My grandma is in a nursing home and would love a visit from a kitty like you. Our gramma had big Golden doggies come to visit and she loves them lots, but we wish she had a kitty to visit with. She loves all animals, but loves kitties best of all. Waffles, yous is one special cat! And yous does great work! GG and Waff, you two make an adorable team. And what an adorable post. Love this story! Waffles is extra special and putting his gifts to help others is what the world needs. Dood, you have the most pawsome job in the world! how very cute. I've always admired your ride, waffles. Do you think there's room for Crepes in there? I'm very flat. - Crepes. I love you, Waffles! You are one awesome cat. Same with Katie! LOVE LOVE LOVE and wish I could turn one of my cats into a therapy cat. Sadly I don't think they have the right temperament. Love the photos. Brilliant! Love Waffles in his Waffles mobile!